Today, being a Bank Holiday in the UK, I decided to have another X-Wing game, this time using my new ships (from Star Wars: Rebels). I decided to try a scenario based on the Season 1 escape from Lothal covered in the episodes 'Empire Day' and 'Gathering Forces'. Agent Kallus: Kallus to Inquisitor. The Rodian Tseebo is confirmed aboard the rebel vessel. Inquisitor: Acknowledged. 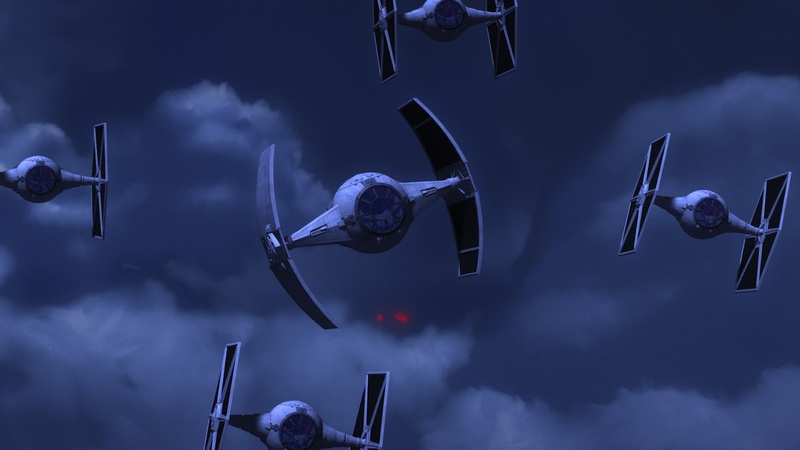 TIEs, assume attack formation. Fire at will. Hera: I need my gunners. Shields won't hold long under this barrage. I used Hera - with a Dorsal turret, and docked Phantom. The Imperials were just out of range when the game started. They had the Grand Inquisitor's Advanced Tie, and 4 Black squadron basic Ties. I went full power, and banked left to try and separate the Ties. 2 went wide right, but the Inquisitor and the other 2 chased me. I broke right again, hoping to get my docked Phantom a shot at the Inquisitor. Realising I was going too fast for my plan to work, I had Hera 'hit the brakes'. ...with the Ties in support. Hera: Chopper, I'm rolling us starboard. Be ready to fire those rear guns. Zeb: Karabast! Chopper's down! Ow. Ow! I've got you covered, Hera. Roll away! I did a hard right bank to try and get a couple of the Ties on their own - and get my powerful front guns into play. One of the Ties fired at me, I could only get Kanan in the turret to fire back! One of my shields flared. Inquisitor: Open fire. Their shields will not hold indefinitely. 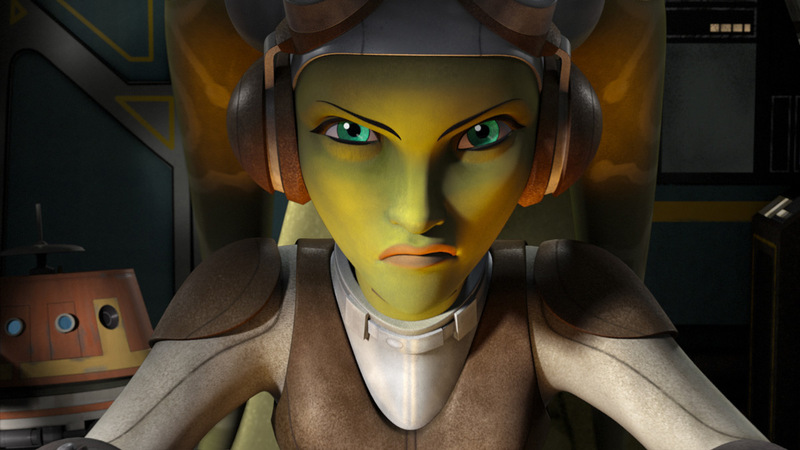 Hera (On Comlink): Sabine, I need you in the nose gun, now! ...But a sharp turn into their rear allowed Hera to splash one of the Ties. Hera: Someone want to explain to me why we're extra popular tonight? Kanan: We've picked up a passenger the Rodian the imperials are hunting. Hera: And he's important because? Sabine: Because his cybernetic implant has downloaded half the Empire's secrets. Hera: Okay, I can see why that's important. Let's get him out of here. I was still only down 1 shield, Hera had evaded the fire from the other Tie! I continued my tight turn, but the Inquisitor did a Koiogran and fired at me! Kanan damaged the Tie at short range on my right. As I turned again, several of the Ties got me in a crossfire, things looked grim! Hera: Shields down! Ezra, I need you in the cockpit! I lost all my remaining shields, and took 2 points on my hull! Zeb on the Phantom's guns ripped the Inquisitor's ship apart! Even Kanan in his turret hit another of the Ties! I decided the last 2 Ties would probably break off at this point! They were not strong enough to take on the Ghost! Hera got Chopper busy fixing the shields, and began calculating the jump into Hyperspace. Tseebo would be useful working in the Rebel cause! In the TV episodes, the Inquisitor was joined by 4 more Ties, and managed to attach a homing device to the Phantom. Not so in this game! It would have been too much! I think 5th Brother and 7th sister would make an earlier appearance in my universe! Today, after a long and difficult week at work, I was only up for a light game, so Wings of Glory it was! I used the stripey tailed Albatros DVa, Alex the green tailed one. Lawrence used 2 Sopwith Camels. We plunged forward, I planned a nose-to nose clash against the more manoeuverable Camels. Surprise! - the Camels banked right away from our advance. We were still too far away to take advantage of this however! ... and Alex broke off from me to engage them. I turned to support Alex and Jammed my guns! Both sides passed without further trouble. Alex Immelmanned to surprise a turning Camel. He caused it serious damage! Lawrence meanwhile did a sharp right turn to ambush me, and caused a small fire! ...but soon turned to re-engage. I had to cross the Camels line to avoid further damage. This unfortunately left Alex facing both Camels. You could tell a single mind was controlling them! Alex turned in front of his pursuers, and was lucky! No damage and one of the Camels jammed his guns! The other Camel kept up the chase! I was still badly out of position, but rushed to try and help clear Alex's tail. The Camel got a good shot in! ...but going down in flames himself! The 'King of the Bang card' strikes again! Good game though. Oddly, we had played the same scenario against the solo system before Lawrence arrived, and got the same result! ...against the solo system with 3 Fokker DVII's! My companions broke left and right, leaving me alone to face the huns! Alex even got a shot at one of the Germans, but jammed his guns. I Immelmanned to join in the chase of the Fokkers. ...but as very little happened till we ended the game! Here are some pictures though, if you are interested? Only the Yellow Fokker had any real damage at the end of 1.5 hours play! We decided the fuel situation was getting bad and ended the game to go home! Still nice to see the Fokker DVII's out again, I think they are very pretty!